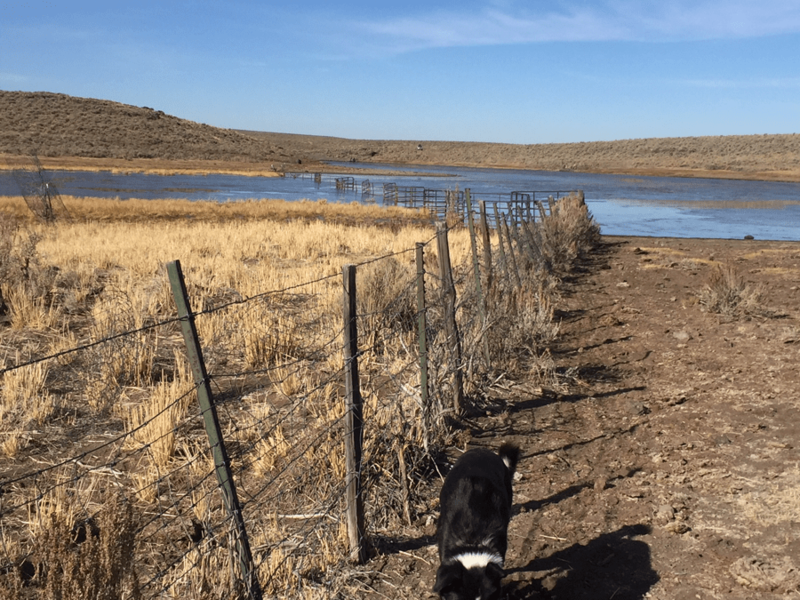 A large area by Jack’s Creek Reservoir in the Bruneau BLM Northwest allotment on the Owyhee Plateau is supposed to be protected by a riparian habitat exclosure. Simplot is the primary Northwest permittee. Nearly every blade of vegetation is eaten and trampled to bare dirt outside the exclosure around the entire unexclosed area. 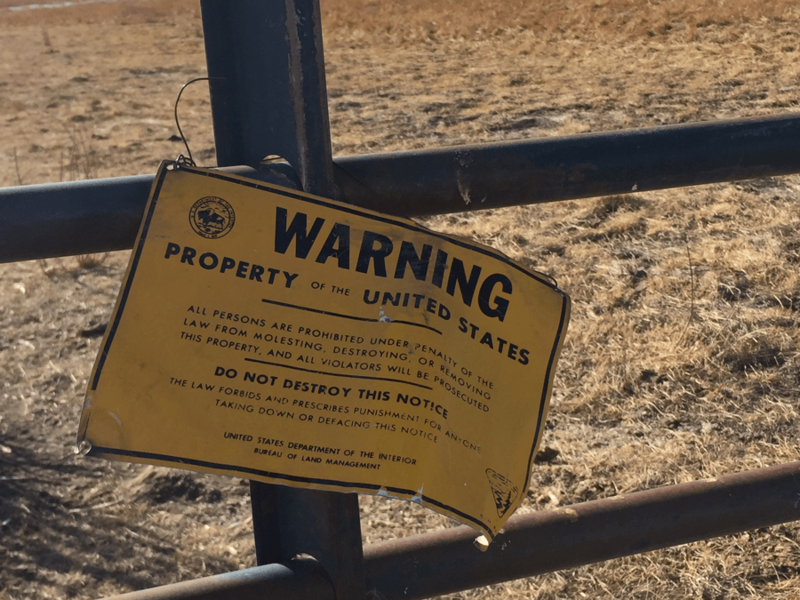 Inside the exclosure, while herbaceous vegetation is present, there was extensive cattle trespass in 2017. Judging by the manure and damage to the woody vegetation, trespass has been commonplace in recent years. 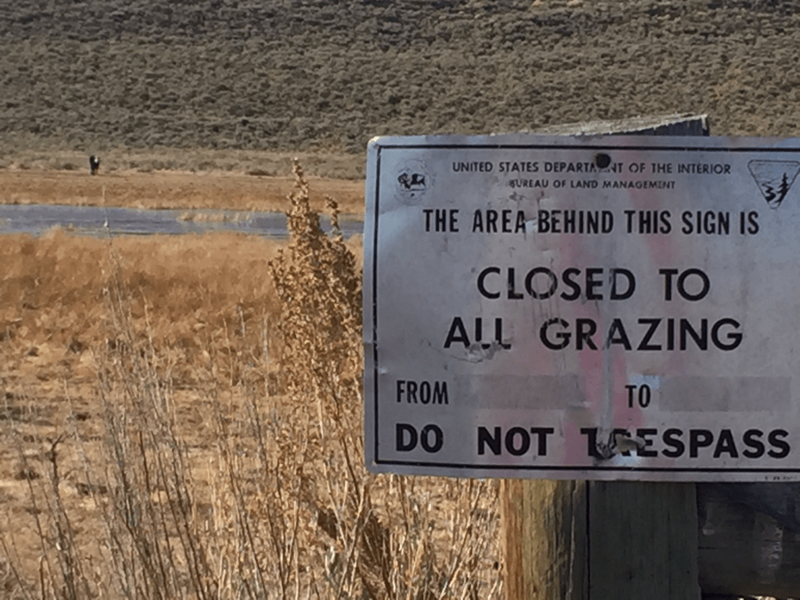 As so typically happens, BLM builds exclosures to claim it is solving grazing problems. 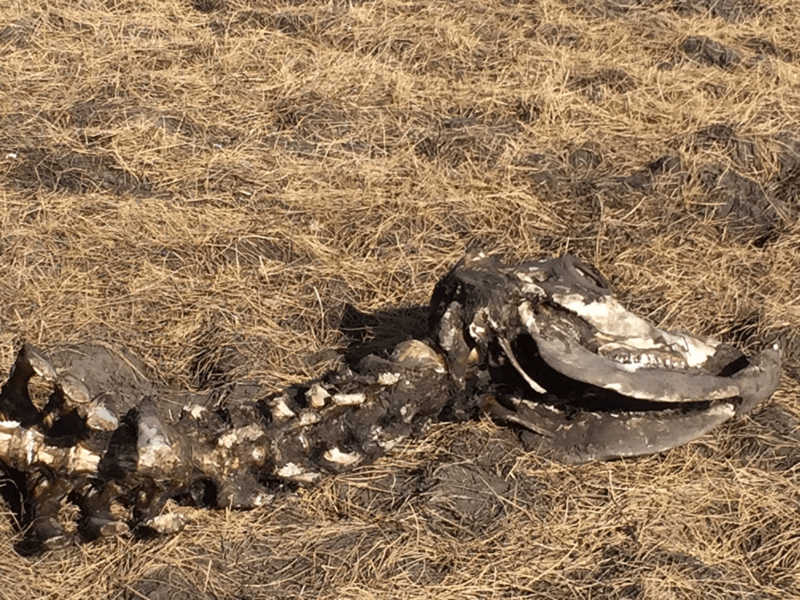 Yet the agency continues gross over-stocking and abusive grazing practices across the surrounding public land. 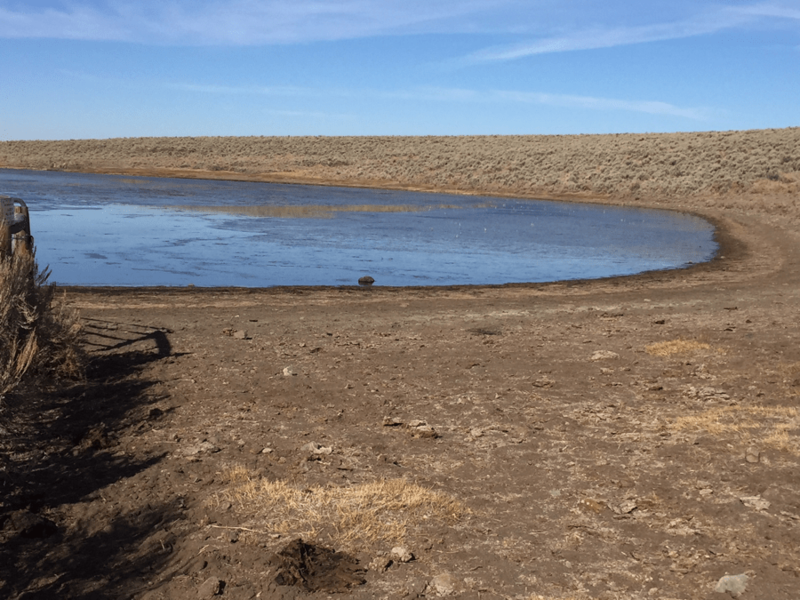 Livestock use becomes even more intensified outside exclosures. 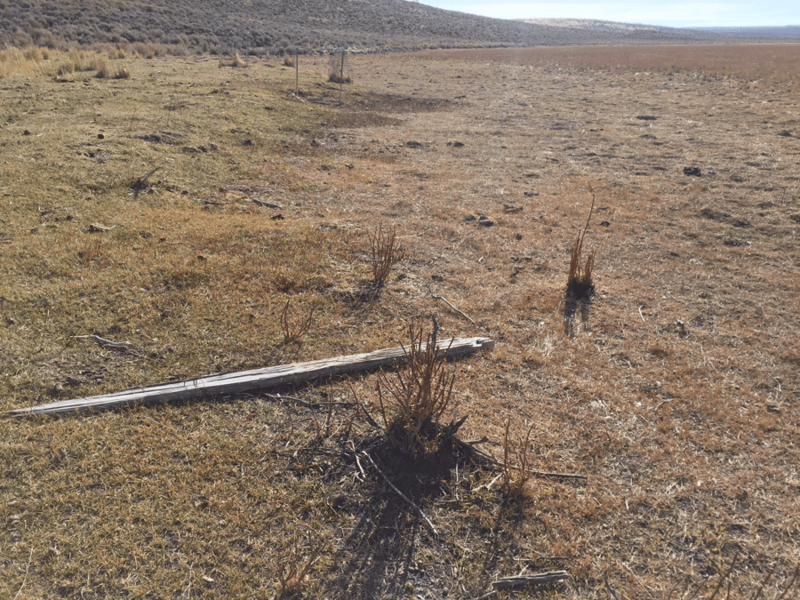 After the first few years, when the agency staff move on and any concern about the exclosure is gone, BLM conveniently starts overlooking relentless chronic trespass. 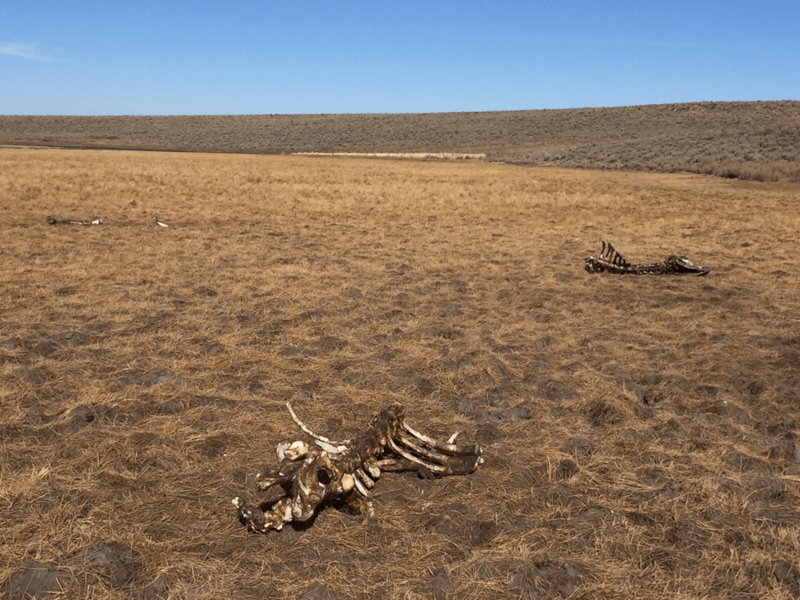 The situation is very bad in Bruneau, where current Boise District and Bruneau Field office Managers have been allowing Simplot (by far the largest permittee in the FO) and other permittees to run roughshod over sage-grouse Focal/stronghold habitat. 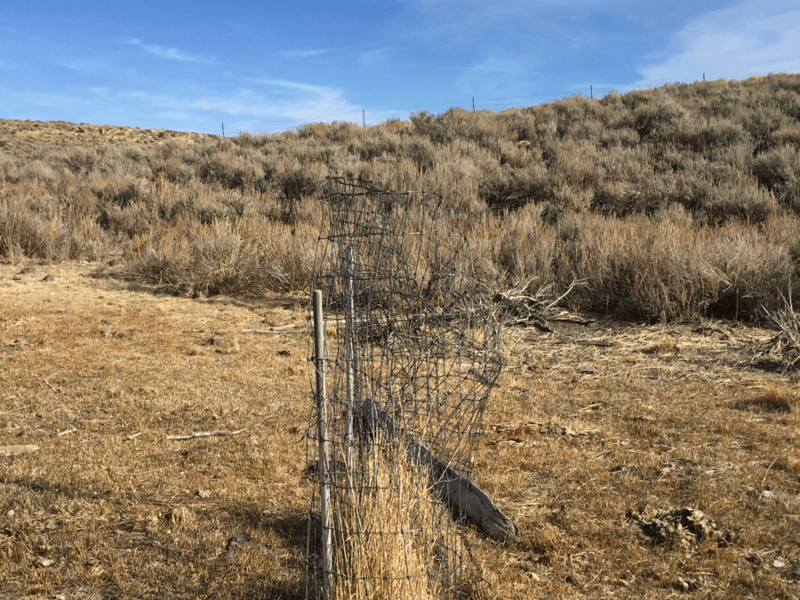 Willows and cottonwoods had been planted at public expense inside the exclosure to jump start recovery of protective woody vegetation cover. Cows have destroyed many of the plantings altogether, and the ones that remain are gnawed to the nub. 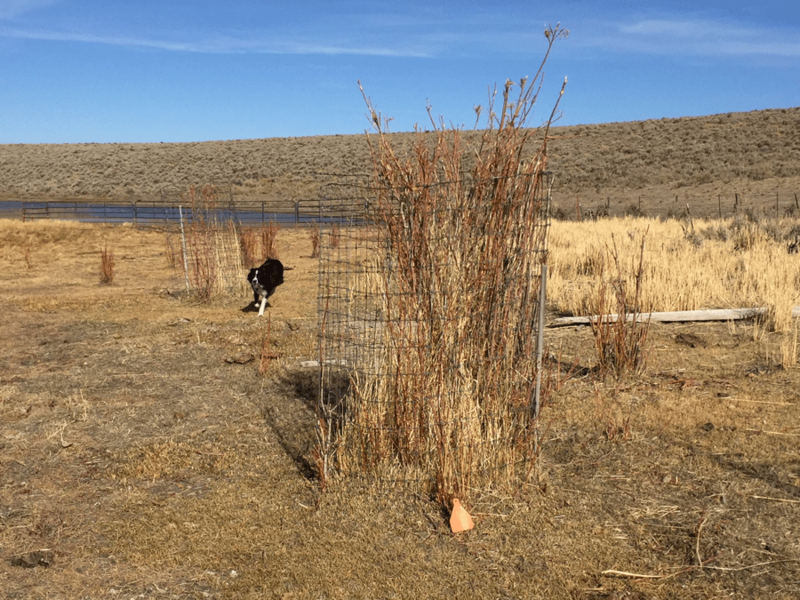 Wire had been placed around the trees when they were first planted to try to protect them from livestock incursions or beavers. Besides breaking down the wires and stakes in many instances, the cows have eaten every bit of woody vegetation they can reach inside the wires. At the time of our 2017 visit, cows had largely been removed from the surrounding area, but one was still present – apparently left behind to die in the winter – inside the exclosure. Pale grass in photos is Great Basin wildrye, which attains a height of 4 ft. or more when ungrazed (as shown by remnant ungrazed clumps inside the wire around trees. 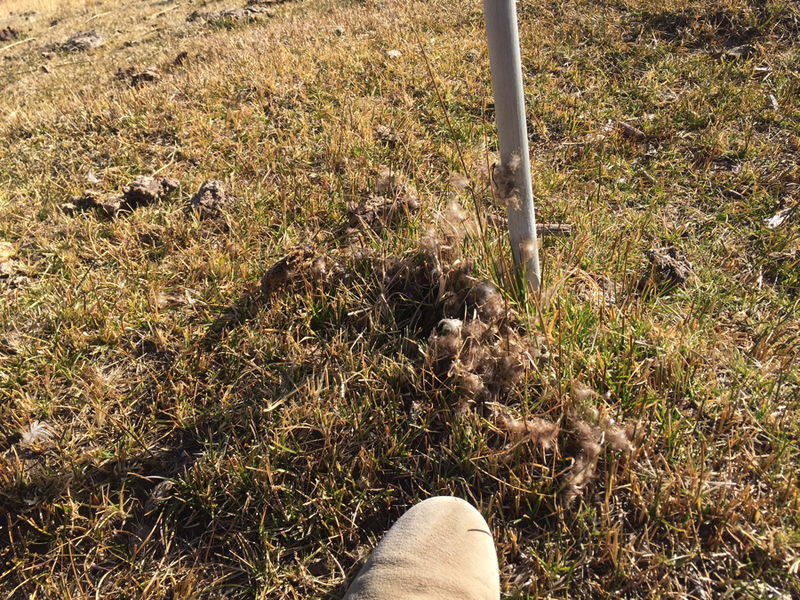 Feathers from a duck nest built in the relative “protection” of the base of a stake, had later been disturbed by cows, and the protective cover vegetation grazed to the ground. 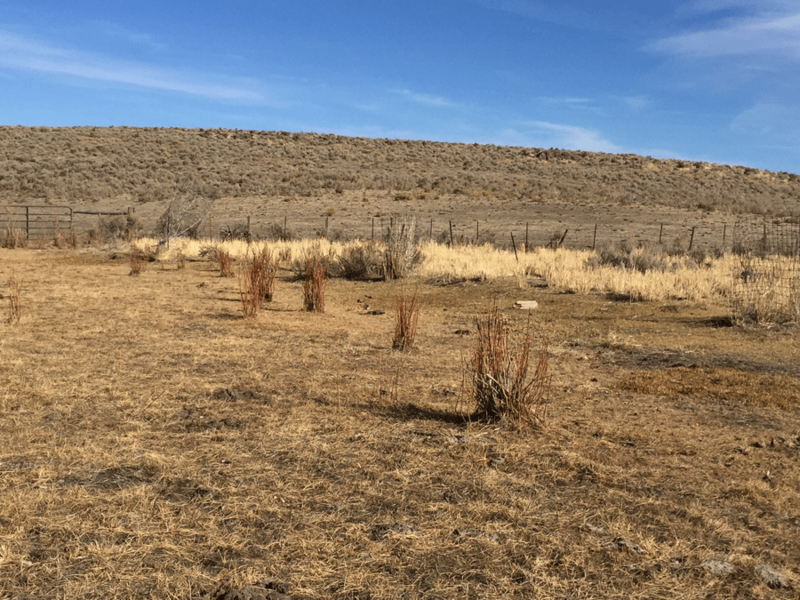 Besides being located in the largest block of remaining sage-grouse habitat, as shown by the extent of Focal habitat ion this area, the site is in the headwaters of Jacks Creek, an occupied redband trout stream. So all the sediment, and cow manure, urine and drugs or hormones the cows may be shot up with flush downstream into the canyons still inhabited by these native trout. 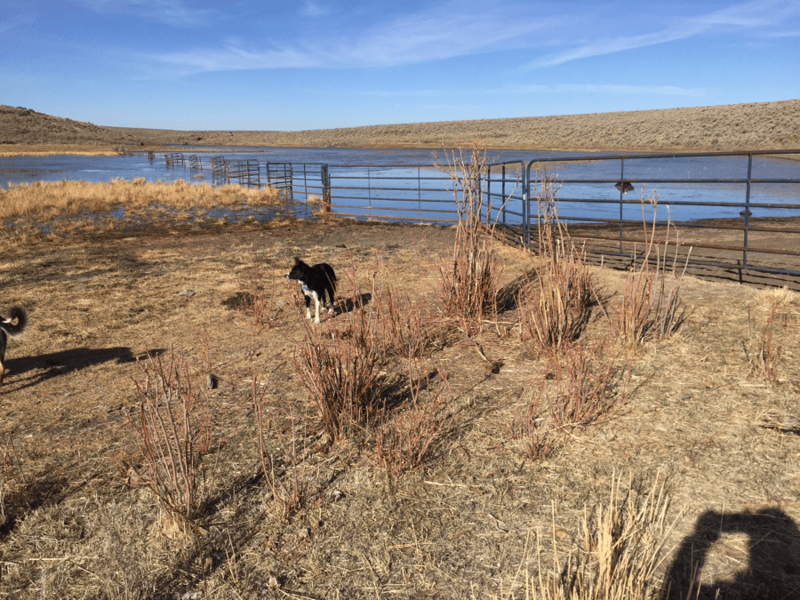 Decreasing flows from the combined effects of grazing and climate change threaten sustainable aquatic habitats. 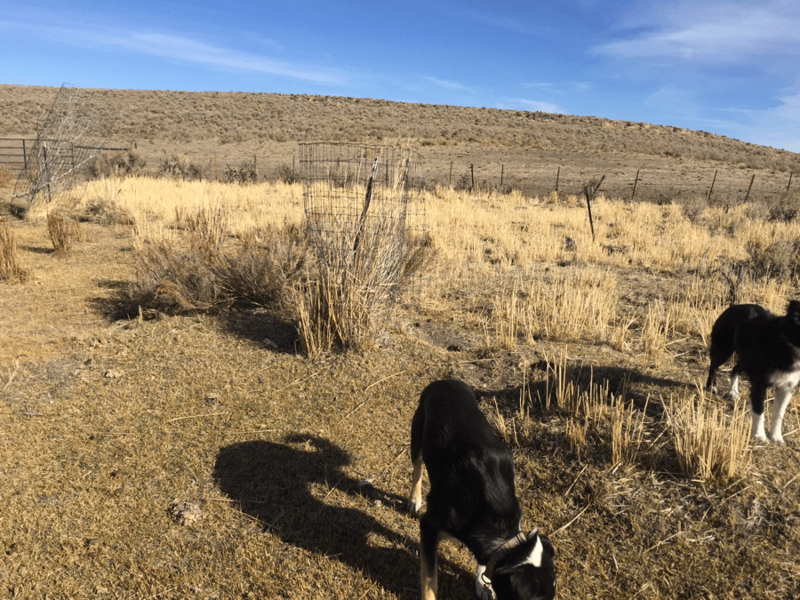 Grass in photo is largely Great Basin wildrye, which when ungrazed, stands 4 ft. tall. Orange ear tag with faded word “Simplot”. The remains of willows severely browsed by cows. Feathers from a duck nest (teal?) that had been built at base of the “residual cover” provided by an old tree protection stake. It appears the nest was built in spring 2017, and the cows later devoured the protective vegetation.